The Menomonie school board Monday approved the hiring of a new principal for Menomonie High School. Casey Drake, a native of Rhinelander, Wis., will begin in the position on July 1. Drake has been associate principal of Lincoln High School in Wisconsin Rapids for five years. He also taught social studies at Badger High School in Lake Geneva, Wis., for eight years, according to a school district press release. Drake has local ties: He earned a bachelor’s degree from UW-Eau Claire in 2005, and his wife, Stefanie Long, is a graduate of the Menomonie High School Class of 2000. The Menomonie school district received 31 applications for the principal position. Five candidates were interviewed by a committee of students, teachers, principals and district administrators. District administrator Joe Zydowsky thanked the committee members Monday, praising the students who met Drake before his hiring. “Everyone who was on the team from the administrative group was thoroughly impressed with our students who were on the committee. … It was truly impressive,” Zydowsky said. Drake also holds a master’s degree from Aurora University and a director of instruction license. Drake and Long have two children: Bella, in fourth grade, and Mason, in first grade. 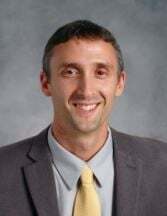 Current MHS principal David Muñoz was hired as a school superintendent in Mosinee, Wis., district administrator Joe Zydowsky announced in March. Muñoz will leave at the end of the 2018-2019 school year. He has been MHS principal for almost nine years. Monday’s meeting was the last board meeting for two members, John Sobota and Tanya Husby. Both chose not to run for their seats again in the April 2019 election. “We thank you so much for your work,” board president Amy Riddle-Swanson said Monday. The two new members of the board, Clint Moses and Chris Freeman, will be seated at the April 22 meeting. The board will also reorganize at that meeting.